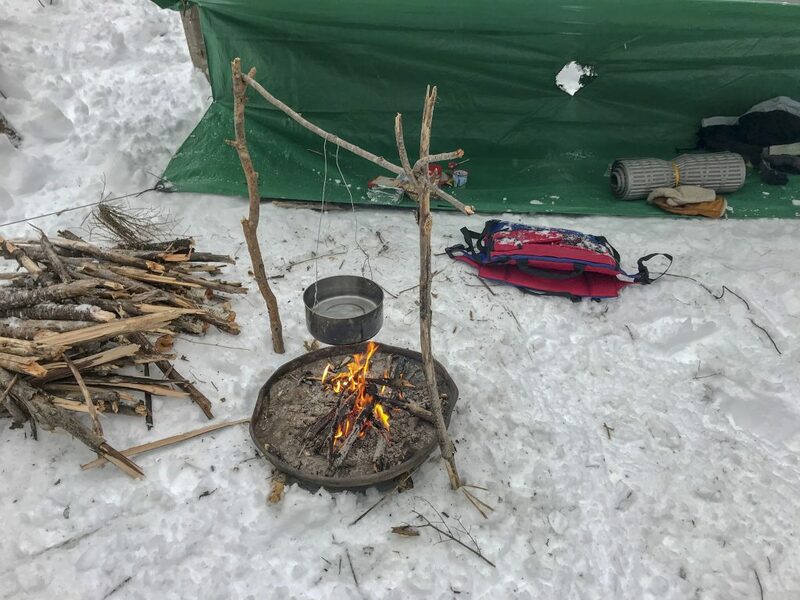 In March of 2018, I set out with seven juniors and my co-trip leader from the Holderness School for a two-week winter camping expedition. I had gone on a similar adventure ten years prior, as a junior at Holderness myself. Just as I had ten years before, during the days leading up to my trek into the White Mountains, I entered the camping mindset. I organized my gear. I filtered out any unnecessary items but still prepared for anything from rain to negative 20 degrees. On our third day out, the weather radio forecasted precipitation and we could feel it. Like a big puffy comforter, the low, thick cloud cover kept the air warm and moist. In preparation for the inevitable, we tightened up camp. We double-checked guy lines, tightly packed away personal gear and group gear, and crawled into our tents. The coziness of the orange nylon walls around me seemed to have increased. I knew they would shelter me from the coming onslaught. I awoke with a start. The need to use the perch overtook me. The darkness was total, and I scrambled to assemble a coat, headlamp and boots. With my clothes half on, I stumbled through the opening of our vestibule. Eighteen inches of fresh snow greeted me. Our tent had transformed into an igloo. Soft pillows of snow blanketed the landscape. Fat snowflakes the size of quarters blotted out the sky. The flakes hitched rides with bigger flakes, gaining momentum as the gobs of snow tumbled through the air. I returned from the “necessary” and made for the comforts of my sleeping bag and tent. I shone my headlamp at the campsite down in the small depression below. I felt relief when through the falling snow I picked out the tent/igloo, but what I didn’t see sent a shock through my body. Where was the tarp shelter where four students were sleeping? Flecks of blue were all that remained of the once proud tarp we had set up. 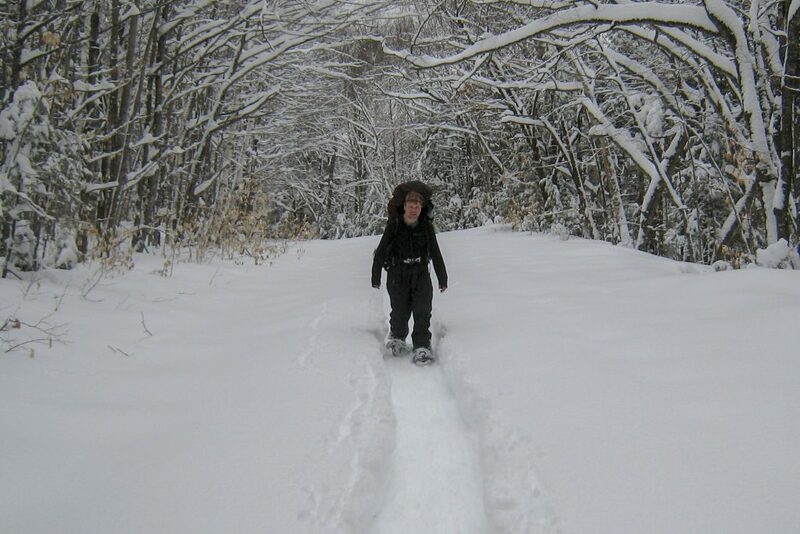 Armed with snowshoes and my raincoat and pants, I set to uncovering our buried crew. Digging with extreme care, I released the 17-year-old Holderness students from their snow prison. Movement under the remaining snow and tarp relieved me of my gravest concern that had been pushing its way to the front of my mind. Unfortunately, once we relieved the tarp of its 100-pound weight, it did not return to its original form. Our once tight campsite was… not. Sloppy knots came untied in the night, and anything exposed to snow disappeared. With ten miles of hiking ahead, the usually mindless task of breaking down camp was quickly becoming a headache. The group I was with included students from Miami and Singapore. It featured lacrosse and basketball stars but included little camping experience, and the night’s semi-disaster had made this starkly apparent. Camping at Pine Island was a source of so many valuable lessons for me. Most of all it taught me to sweat the details. A tarp with a loose corner could lead to wet and ruined food; a sloppy kitchen could lead to lost utensils or cookware. I found myself wondering how a group of experienced Pine Islanders would fare on this winter camping expedition. I knew they would laud the lack of bugs, the ability to camp anywhere, and the excellent campsite furniture built out of snow. How would they handle the extra stresses of the dangerously cold temperatures and trudging through the snow? My sense was that they would have handled it well because the six P’s apply no matter what the season. A second Nor’easter was forecast to deliver another 15-20″ of snow. We doubled up our days, pushing forward while there was only a foot of soft snow as opposed to the three feet that would soon blanket the trail. We settled into a high mountain valley we hoped would shelter us from the 40 mile per hour winds that would soon shake the trees and try to steal our warmth. A small patch of spruce trees yielded flat ground and further shelter. A short hike up the trail led us to a deposit of massive glacial erratics: three 50-foot-tall rocks, one split in two. One half formed a platform, the other a shield. We anchored a tarp at the top of the massive granite wall. We set up two other tarp structures nearby, one to protect our gear from the snow that would act as an invisibility cloak to anything not under shelter and the other tarp for a group to sleep under. We paid special attention to each knot. I woke to find a similar site to the week prior. The snow erased the orange of our tent, the spruce trees were steep, white A-frames. As I approached the camping tarp, I was pleased to see that the knots had held and our snow walls had protected the occupants from the snow billowing in through the sides. Our tarp was as sturdy as it had been the moment we set it up. Like so many Pine Islanders, the Holderness students had seen first-hand the payoff for sweating the details. We spent the day under the tarp along the side of our massive rock wall with a fire blazing as snow collected inch by inch and foot by foot. I sat back and let my exposed feet toast by the fire. Reading Lonesome Dovewhile enjoying my third cup of hot cocoa, I thought to myself, this is how a Pine Islander should enjoy a winter camping trip. This is one of the stories available in the upcoming edition of Pine Island Camp’s newsletter, The Pine Needle. Stay tuned for more! This entry was posted in Pine Island Staff, The Pine Needle on January 23, 2019 by Pine Island Camp. Holderness was a natural fit for me, as a Pine Islander. Out Back may have been one of my finest hours, there, too. Ours was a bitter cold adventure, the sort of cold for which the Pemigewasset Wilderness is infamous. I, too, took it blithely, having been more than adequately prepared by a certain disappointing PIC Montalban Ridge trip in 1978 or 9. As I recall, that trip was all cold rain seasoned with sleet at the higher altitudes. Using a poncho as a tent taught me important lessons in hydrology , the knowledge of which I used at Holderness, and, later, leading Maine high school students on trips in the aughts. Keep up the great work, Sumner!